We are so sad to hear the recent news coming out of Mali. Please take the time to read this article and others that have been written over the last year. Daniel Dembele remains safe and Banko, in the South, should be unharmed for the time being. But the fabric of Mali is coming apart at the seams. Codirector Morgan Robinson, Coproducer Claire Weingarten and Dr. Richard Komp were in Berlin to accept the Cinema for Peace International Green Film Award. What an UNBELIEVABLE honor!!!!! We’re definitely still in shock. Hopefully this will give the film that much more opportunity and exposure to be seen by viewers around the world. Thank you to the Cinema for Peace Foundation for honoring our little film. 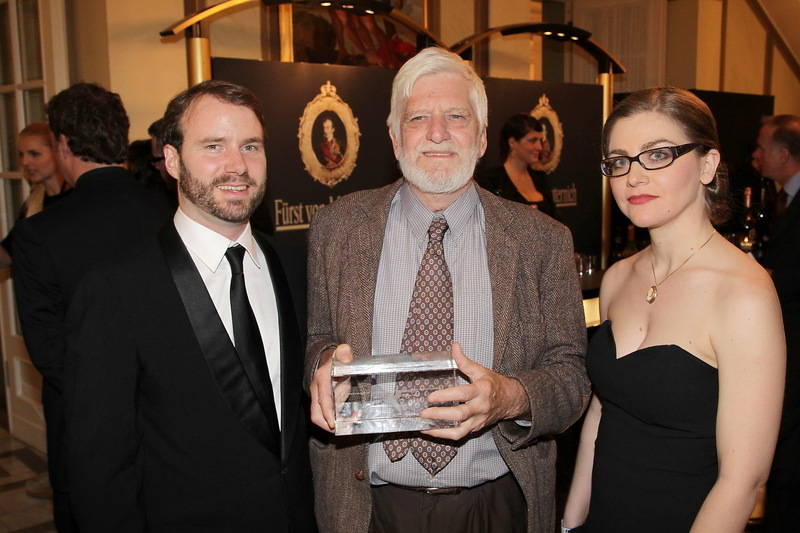 Morgan Robinson, Dr. Richard Komp, and Claire Weingarten accept the Cinema for Peace International Green Film Award in Berlin. BITS has been nominated for a Cinema for Peace 2012 International Green Film Award – wow! Dr. Richard Komp and coproducer Claire Weingarten will travel to Berlin this weekend to attend the Cinema for Peace gala at the Berlin Film Festival, where Dr. Komp will also give a presentation about his work. Well folks, it’s been a long time coming. We are so proud and excited to announce the national broadcast television premiere of our film — on Sunday, Jan 29, at 9pm EST & PST, BURNING IN THE SUN will debut to national audiences as part of PBS’ AfroPop series. Alongside some stellar documentary programming featuring stories of the African Diaspora, and hosted this season by comedian Wyatt Cenac, our film will be seen like never before! We invite you to watch, and to help us celebrate this story by spreading the word far and wide. Fundraiser results, WIRED article, and our African premiere! First, we are happy to announce we raised $12,350 during our winter fundraiser!!! These funds went directly to Afriq-Power and will be used on solar energy projects in Mali. Thank you so much to everyone who participated, either through direct donations or by purchasing DVD’s – your power has made a direct impact!! Next, Burning In the Sun’s main character, Daniel Dembélé, and his business Afriq-Power were featured in WIRED UK – check out the link to the article here – and get updated on the new directions Daniel and Afriq-Power are headed. We are all the more proud to have profiled Daniel’s work in it’s early stages, now seeing the various innovations he has been inspired to take on. BITS had it’s African Premiere just recently at the Addis International Film Festival in Addis Ababa, ETHIOPIA. The film was honored as one of the Opening Night Selections and showed at the American Embassy. Video will be coming soon of the Q&A session after the screening, with codirector Morgan Robinson taking questions from the audience via a live Skype feed. And finally, our Canadian Premiere has just been announced: BITS will be showing at the Society for Visual Anthropology (SVA) annual film festival this November 19th in Montreal. If you are near Montreal, please come support the film! May already, wow! 2011 sure has flown by. Burning In The Sun continues to show in theaters and festivals around the world, with upcoming premieres in the UK and Australia, and sold out recent screenings in Washington D.C., Portland, OR, Princeton, NJ, Belmont, MA and Claremont, CA. Keep a lookout on our screenings page for upcoming dates. We’re also thrilled to announce a new partnership with Bullfrog Films, who will serve as the film’s educational and non-theatrical distributor in the U.S. and Canada. This relationship will extend the film’s reach to thousands of high schools, colleges, universities, community centers, regional arthouses and non profit organizations in North America, a real coup in increasing the film’s visiblity and impact. If you’d like to show the film for educational or other non-theatrical purposes, please contact Bullfrog Films! Soon we’ll be announcing the results of our winter fundraiser. To celebrate this and other successes, we’re releasing an exclusive video recently produced by BITS codirector Morgan Robinson, called Burning In the States: NYC Teens Go Solar. This piece will be available as one our DVD extras on the release from Bullfrog, but we encourage you to watch the film right here and now – enjoy!!! Those of you on our mailing list already know this, but we are having an end-of-year fundraiser to benefit Afriq-Power directly. In concert with a generous anonymous matching grant of $10,000, from now until December 31, 2010, 100% of proceeds from BURNING IN THE SUN DVD’s sold will be given to Afriq-Power through it’s U.S. non-profit partner Practical Small Projects, and matched dollar for dollar up to $10,000. This means that together we have the power to donate $20,000 to Afriq-Power directly, contribute in a meaningful way towards the organization’s sustainability with a healthy investment of capital, and help in the effort to provide affordable solar energy to rural communities in Mali. You also get a unique opportunity to see BURNING IN THE SUN on DVD, or give the film as a gift! Go to Indieflix at http://www.indieflix.com to make the purchase. To make this opportunity available to you is a big step for us, so we’re very grateful for your participation. Also, good news to deliver: We won! Not only did we make the finalist round on Link TV’s View Change Online Contest, we won in our category of ‘Innovation!’ This means that thousands more people will have the opportunity to view, learn from, and interact with the film on Link TV in years to come. We are so honored to play this part in the inaugural launch of their View Change website and interactive portal. Check it out for yourself here. Thanks to all the BITS fans for your support and helping us to make this happen. Finally, new festival announcements: BITS will be coming to communities in Claremont, CA, Princeton, NJ, Washington D.C. and Portland, OR! This means hometown screenings for Claire and Cambria. Check our Screening page for dates and details, and be sure to join us and spread the word. Until then, warm holiday and new year wishes to all.